The Bridge Sensor Application Adaptor is used to connect bridge sensors like strain gauge, force sensor, pressure sensor, load cells in PC or Smartphone based Data Acquisition Systems. Used with the EMANT300 USB Data Acquisition Module or the EMANT380 Bluetooth Data Acquisition Module, they form a very low cost Bridge Sensor Data Logger or Instrument. It is ideal for use in hands-on teaching laboratories or projects involving bridge sensors. the EMANT380 Bluetooth DAQ (or EMANT300 USB DAQ). Power supply for the EMANT380 not shown. The schematic and PCB layout in Eagle format is available for download. Note that the information is provided AS-IS and no further support is available. 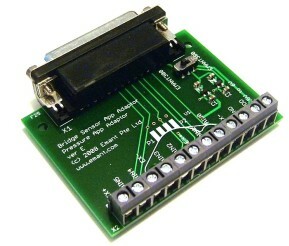 It is intended for those familiar with electronics and Eagle PCB layout.